I’m not a big maple syrup fan, and I rarely eat pancakes, so keeping a jar of the stuff in the cabinet just doesn’t happen around here. It’s also crazy expensive – since I halved the recipe and only needed two tablespoons, I just didn’t feel that it warranted a new bottle. Luckily though, I had something that would fit the bill perfectly. I ended up substituting Lyle’s Golden Syrup, which worked like a charm. I first found out about Lyle’s last March, when I made British Flapjacks, a yummy granola bar-type treat that’s extremely popular in Great Britain. Golden syrup is rich and sweet, almost like honey. 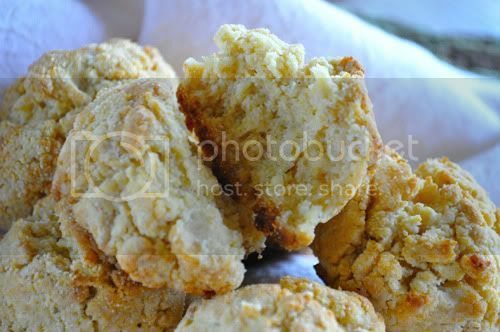 The ‘biscuits’ were tender and completely crumbly, but not flaky like a traditional biscuit. It was a super-simple recipe that would be wonderful with a nice, hot bowl of chili. File this one away for Fall! Lindsay from A Little Something… Sweet is our hostess this week. 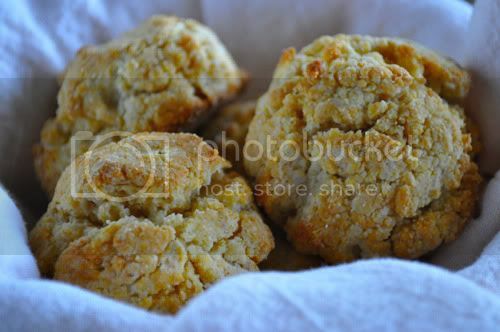 To see the recipe and make a batch of your own, click over to her blog… and to see all the other Maple Cornmeal Biscuits, check out the ‘Leave-Your-Link’ post on TWD! These were good. Will have to try with Golden Syrup. These look great! I’ll definitely have to make some your way because I have some Lyle’s for a British cake I’m making. Very pretty! Great idea to use the golden syrup, too. My daughter discovered Lyles Golden Syrup when she served a mission in Australia. We found some at World Market last week–along with TimTams! The biscuits were excellent! We will make them often. Great sub with the Lyle’s. I like maple, but like you said, it’s super expensive, and these biscuits are not what I’d make with it. I think I’d even use honey instead next time because I love cornbread with honey. That was a great idea to substitute the golden syrup. I remember the first time, I heard of that and had no idea what it is. We do learn as bloggers. We usually have golden syrup at home too and that would have been good! Your biscuits look so light and fluffy. I have Golden Syrup in my pantry, and I’ve never used it. I may have to break it out. 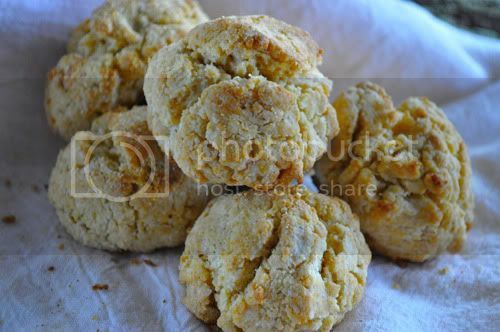 Golden syrup is an excellent sub in – I bet these tasted like Aussie damper! yum i bet these were delicious–and i love your photos! those look terrific! i use golden syrup all the time. it’s a perfect sub for corn syrup as well. What a great substitution! Had I known that the maple flavor of these biscuits would be so subtle, I might have saved my maple syrup and used some Lyle’s. They look great!